ST. PETERSBURG, Fla. April 17, 2019 — St. Petersburg-based software company, Squaremouth, has been named one of the Best Places to Work in Tampa Bay by the Tampa Bay Business Journal, ranking No. 5 in the “Medium” company category. A new company headquarters, combined with a unique set of benefits and a transparent company culture, landed Squaremouth on the list of top workplaces. After outgrowing its rented office space, Squaremouth purchased a 20,000-square-foot church to serve as the company’s new headquarters, adding the flexibility for new employee benefits and perks. A badminton court, snooker table, arcade games, and fully stocked bar were the earliest additions as construction begins. Future plans for the new office emphasize perks that will contribute to a greater work-life balance, including a fitness center, on-site daycare, and napping areas. Tree houses, a bar, and a coffee shop are other notable features planned for the new space. 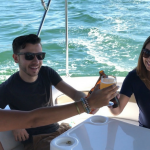 Many of Squaremouth’s benefits ring true of Silicon Valley startups, including unlimited paid vacation with a mandatory 10-day minimum, quarterly bonuses, company trips, access to a company boat, and a birthday beer bonus. Squaremouth staff also enjoy a number of other perks, such as weekly paid lunches, in-office happy hours, and surprise gifts. As the company grows, Squaremouth continues to implement new policies that naturally promote work-life balance. In 2018, the company added work from home days and flexible scheduling, allowing full-time employees to choose when they start and end their workday. While the company’s numerous benefits and perks are popular among the staff, most employees say their favorite part of Squaremouth is its transparency. From the office floor plan to the company’s financials, everything at Squaremouth is open. Employees know each other’s salaries, and major company decisions, including new hires and employee raises, come down to a majority vote. Squaremouth’s “nothing to hide” philosophy promotes trust among team members and management. The open office environment reflects the importance of transparency and employee collaboration at all levels, which allows staff to recognize their involvement in the company’s success. This is Squaremouth’s third time on the Tampa Bay Business Journal’s Best Places to Work list. The awards recognize workplaces where employees feel valued, receive fair compensation and benefits, trust leadership, and feel their teams and managers are effective. Squaremouth is consistently recognized as a top workplace, both locally and nationally, including being named one of the Best Small Workplaces and Best Workplaces for Women by Fortune Magazine and one of the Best Workplaces in America by Inc. Magazine for the past two years.